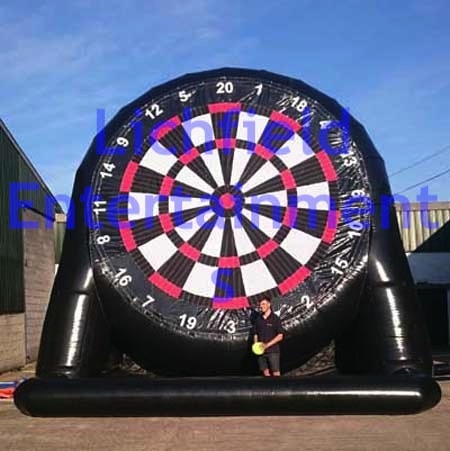 We have two Giant Football Dartboard games with the largest standing over 26ft tall that makes it a great centre piece attraction at any event as it really can't be missed! If you don't have the space available for the huge one we have a smaller 14ft version as well. Participants are given three velcro footballs that are kicked at the giant dartboard with the total score of the three shots added up. This game is ideal for football club fun days, corporate fun, team building, promotional events, and stag do's. This large version really is huge and requires a minimum overall operating area of 60x60ft with a height clearance of 27ft. The smaller version needs 30x18ft with a height clearance of 15ft. This activity is supplied with staff to run the game for you, keep track of scores, and ensure all runs smoothly. Due to the height of the largest board you need a relatively decent kick so we recommend it for ages 9 upwards. For the smaller version we recommend a minimum age of 6.